In 1992, the international collaboration The Terra Nova Project reflected on the repercussions of the 1492 discovery of the Americas by Columbus. It united artists from Germany, Canada and the United States in a series of performances in Germany, Montreal, Cambridge, MA and Washington, DC. I created two murals for Norm Davis’ multi-media work Terra Nova, a Choreotale, with original music by Michael McLaughlin, dance by Stephanie Rae Parker and Peter Di Muro. This was followed by the expansion of the group to include artists from Scotland , the Czech Republic and Mexico in another series artworks for performances, Cafe Noir--A Celebration of Death in the 20th Century and Licht in 1993-4, and Chaos, in 1996-7 (See image above). 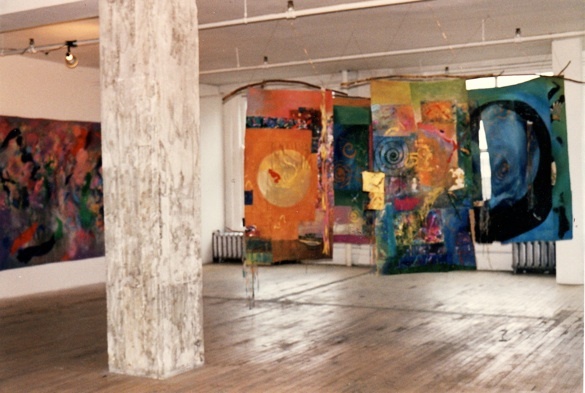 Second Stage Chaos was a series of double sided canvas collages hung from branches with a sound installation also used in dance performances in Montreal and Washington, DC. 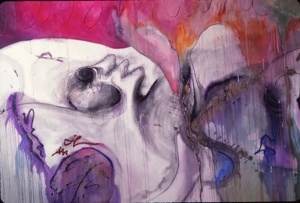 Other large scale works have been used in videoart projects. 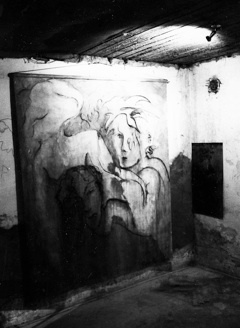 My first art installations began as a collaboration with Norm Davis on his theatrical works. It started with Songs of Pirates, a series of cabaret songs, and was followed by the solo performance Rimbaud--His Life in Scenes and Music, performed in Montreal, Boston, New Orleans, New York City and Washington, DC.